Published by Sampson & Murdock Company, New York, 1926. Cover is worn. Binding is cracked and a little loose. Inside pages are nice and clean. 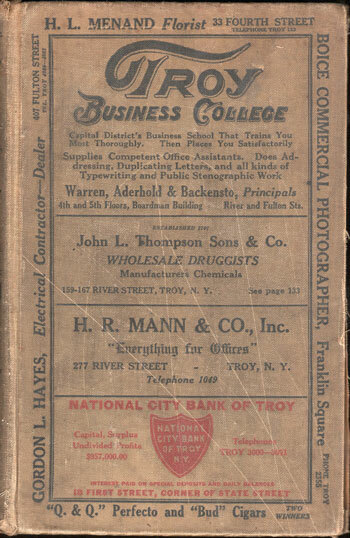 An alphabetical directory of the residents of Troy, Cohoes, Waterford, Watervliet and Green Island, New York with their address and occupation. Also included in this directory: Business Directory, House Directory and Street Directory. Hardbound, 1,082 pages. Also includes numerous interesting business ads.